Out of Joint’s revolutionary production of Samuel Beckett’s All That Fall transfers to the West End after an acclaimed run at Wilton’s Music Hall. 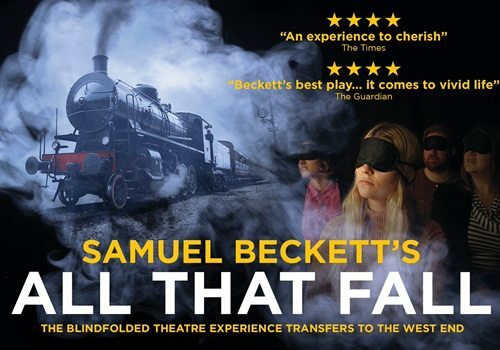 Directed by the company’s head Max Stafford-Clark, All That Fall is a rare live production of one of Beckett’s most famous radio plays. Opening at London’s Arts Theatre for a strictly limited season, the piece is set to run from April 13th to May 14th 2016. Stafford-Clark plunges audiences into the dark in his latest production, which sees audiences blindfolded as actors move around them to create a 360 degree live sound experience unlike anything seen before. A soundscape of words and noises will tell the story of an old woman who heads out to greet her husband at the station on his birthday. Soon, events take a dark turn, and the audience plunge into an amusing, moving and deeply chilling journey. All That Fall stars Tony Award-winning actress Bríd Brennan (The Veil, Brooklyn) as the defiant yet self-pitying Maddy Rooney, alongside Adrian Dunbar (The Line of Duty) who plays her husband. Additional cast members include Killian Burke, Tara Flynn, Frank Laverty, Gary Lilburn and Ciaran McIntyre. With sound by the prolific designer Dyfan Jones, All That Fall transports audiences deep into the heart of this woman’s treacherous trip. First broadcast in 1957, All That Fall is recognised as one of Beckett’s most naturalistic and accessible plays, marking the first time that he used a female protagonist. All That Fall is brought to life at the Arts Theatre London with stunningly effective sound, in a radical production that is sure to entirely immerse audiences. Stafford-Clark’s newest production runs from April 13th to May 14th 2016 on London’s West End. All That Fall has an age recommendation of ages 12 and up. Please note that any latecomers will not be admitted.